Colours may vary from computer screen. The ability to maintain consistent thread tension is the most important variable to quality and efficient production. Fil-Tec Glide™ with Advanced Trilobal Technology will maintain consistent tension throughout each and every spool. The results are high quality, consistent stitch formation, fewer thread breaks, and fewer machine stops. Glide utilizes special technology to capture a beautiful luster within the fibers of a colorfast polyester. We welcome you to compare our Glide colors to your favorite polyester or rayon thread. 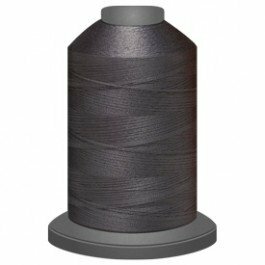 Fil-Tec Glide with Advanced Trilobal Technology will maintain consistent tension throughout each and every spool. The results are high quality, consistent stitch formation, less thread breaks, and fewer machine stops. Glide offers superior coverage for all your sewing applications. Uniform and complete coverage (fill) provides a unique look. The thread appears to melt into the fabric. Customers rely on the superior strength of Glide in fast-paced production environments. Stronger thread translates into fewer thread breaks and less machine downtime. Glide runs virtually lint-free through your machine’s needle and tensioners. Mon - Fri 10a-5p, Sat 10a-4p, CLOSED SUN.